It's Thursday Theme day over at Picture This! This week the theme word is "fair". 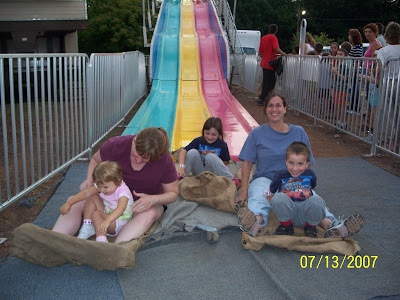 I thought it was the perfect time to share a few pictures from our visit to the fair in Berkeley Heights. They hold this event every year... but it is the first time I ever went. We joined my sister-in-law Andrea (who is originally from Berkeley Heights) Zoe's cousins Alex, Larisa, and Nina, and Andrea's parents. We had a really fun time. 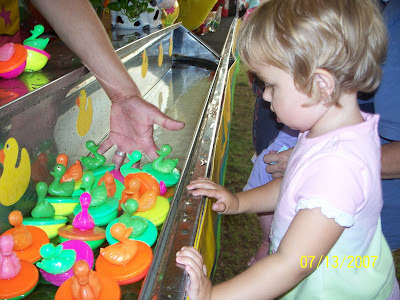 Zoe played her first carnival game. She wasn't quite sure what she was doing. First she just watched those little ducks swimming past. Then when she finally listened to us all telling her "pick a duck, pick a duck" she grabbed a duck. You can only imagine the look on her face when the lady running the booth took her duck... and then told her "pick another duck!". Zoe was pretty mad when all 3 ducks were plucked away from her. The stuffed duck she won was not very well received. I don't think Zoe thought the whole process was very fair (again with the theme). She would've been quite happy to keep the floating ones for bath time. 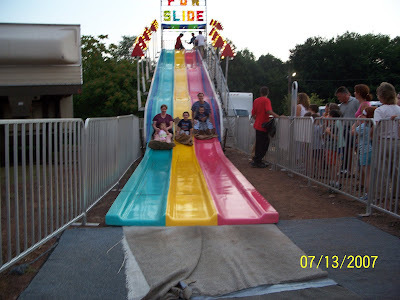 I think the big slide was everyone's favorite ride of the evening. Zoe, Alex and Larisa would've climbed those stairs all night long if we would have let them (and if the line didn't get longer and longer). I have to admit... I think Andrea and I liked the slide quite a bit too!